Excess Equipment Auction - Various Pickup Locations (All Nebraska). Payment Instructions: Sales tax applied to invoice total, including Internet Premium - Sales tax will vary by location of equipment, 5.5% to 7%. We accept Wire Transfers and Checks as forms of payment. Preferred method of payment is wire transfer. The invoice sent by Proxibid is for your review - do not pay from this invoice. An invoice will be emailed to you with all applicable taxes & fees from Jack Nitz & Associates (noreply@nitzauctions.com). No Equipment will be released until payment is made. Credit cards will be accepted on a LIMITED basis for auction purchases $500.00 or less. The auction company does not have access to your credit card on file with Proxibid, you must provide this directly to the auction company. (3% Administration Fee Applies - Visa, MC, Discover). Credit cards will not be accepted for amounts over $500.00. All Sales are subject to Sales Tax Laws in the State in which the Auction is being conducted (State of Nebraska) - Sales are subject to City & State Sales Tax and is determined by where equipment is located. This may include Buyer's Premium & other fees. Any/all Purchasers will be expected to rely upon his/her personal inspection or investigation of the property being offered at the Auction, or that of an approved party to Buyer, and not upon any representation of warranty or condition by the Seller or the Auction Company. Seller or Auction Company will, in NO WAY, be held responsible for any discrepancies, damage or loss of any property of the Buyer once the Auctioneer says SOLD. Please read Terms & Conditions in full. Confirm amount due with the Auction Company before sending payment. Shipping Instructions: Removal address & contact information will be provided to winning bidder at the time of checkout. Location of items is disclosed in the description of the catalog. Any and all methods of lifting, towing, dismantling or any other requirements for the removal and transport of equipment is the sole responsibility of the Buyer. Preview Date & Times: Online Only - call office with questions. Checkout Date & Times: Please confirm amount due before sending payment! No Equipment will be released until payment is made. 1. Any & all announcements made from the Auction Block take precedence over all printed material & advertising. The information provided in this catalog is deemed correct, but is in no way guaranteed. We will in no way be held responsible if the information provided to us was incorrect to begin with. While descriptions are believed to be correct, the Auctioneers or owners make no warranties or guarantees as to the genuineness, authenticity of or defect of any items & will not be held responsible for advertising discrepancies or inaccuracies. It is our sincerest intention to provide the potential buyer all the information that pertains to the various items. 2. ALL SALES ARE FINAL. All Property is offered in 'AS IS, WHERE IS' condition, unless otherwise specified by the Auctioneer. No Warranties, either expressed or implied, will be offered. 3. Once the Auctioneer says 'SOLD', the equipment becomes the Sole Responsibility of the Purchaser. 4. The Auction Company reserves the right to reject the Bid of any purchaser or revoke any/all bidding numbers from any purchase, who in the past has presented a problem for collection to either the Auction Company or Seller. 5. Any/all Purchasers will be expected to rely upon his/her personal inspection or investigation of the property being offered at the Auction, or that of an approved party to Buyer, and not upon any representation of warranty or condition by the Seller or the Auction Company. Seller or Auction Company will, in NO WAY, be held responsible for any discrepancies, damage or loss of any property of Buyer once the Auctioneer says SOLD. 6. Any/all prospective Purchasers will be required to register for a bidder's number and present proper identification when registering. 7. All purchases MUST be settled for, IN FULL, on Auction Day. In the event of a wire transfer, if payment absolutely cannot be made on Auction Day, the Purchase must be settled for by the next available Business Day. 8. ABSOLUTELY NO Equipment will be removed from the Auction Site until Settled for. Any/all Equipment left at the Auction Site after the Auction will be the SOLE Responsibility of the Purchaser. 9. 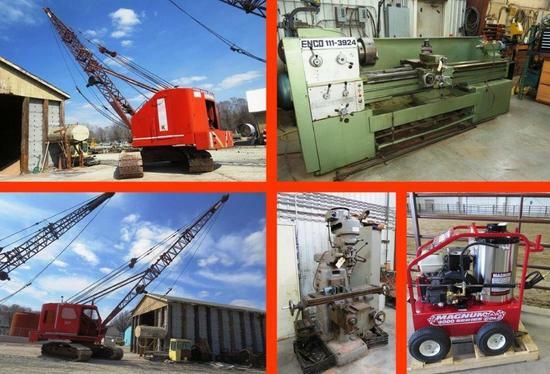 All Arrangements for Removal of the Equipment MUST be made through the Auction Company or Seller. 10. Any/all announcements made from the Block on Auction Day will take absolute precedence over any matter of print or any matter of previously printed advertising. 11. Neither the Sellers or the Auction Company will assume any liability or responsibility for transfer costs or damages to the equipment resulting in a loss to the Purchaser, either due to negligence or natural accidental occurrence circumstances. Furthermore, Purchaser will hold harmless both the Sellers and the Auction Company, and their heirs and assigns, from any litigation and/or loss due to any lawsuit brought by Purchaser for any loss that he/she may endure. 12. By making a bid, regardless of how such bid is made, Bidder acknowledges that Bidder has received, read, understands, and agrees to comply with and be bound by the Terms. 13. Jack Nitz & Associates shall not be liable or responsible for any interruptions, termination or corruption of any audio feed, video feed or of any other internet registration, bidding or other online related service that occurs before, during or in connection with the auction sale, regardless of the cause of fault attributable to the interruption, termination or corruption of such services. 14. A Credit Card is required for bidding approval and will be used as a verification tool. Credit cards may be accepted as a form of payment on a limited basis - 3% administration fee applies. Unused Maxam 12-16.5 Skid Steer Tire 12-ply (4x$).